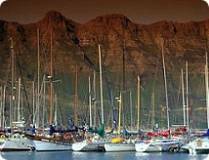 For a quaint and more rustic feel, head for picturesque Hout Bay. This 'fishing village' town is nestled between mountains and sea and will offer you a relaxed and homely environment far (but not too far) from the crowds of the nearby Atlantic Seabaord. There are a number of good restaurants along the main street as well as a selection of shops selling clothing, arts and curios. 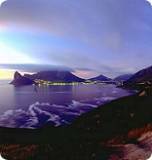 Hout Bay beach is safe for children and is popular with watersports enthusiasts. Chapman's Peak Drive, the route to Noordhoek and Kommetjie, is one of the most spectacular drives in the Cape- it is now a toll road payable on the Hout Bay side. The route up Suikerbossie Hill brings you to Llandudno and the Atlantic seaboard. Please note: Chapman's Peak drive is currently closed until further notice. You'll find accommodation in hotels, guesthouses and B&B's as well as self-catering apartments and houses.